How Far Along: Twenty Weeks. Halfway there, crazy! Size of Baby: A banana. (About 6.5 inches from head to rump, and 10 inches from head to toe. She weighs 10.2 oz). Cravings: Popsicles, cheese & crackers, all fruit, orange juice, macaroni & cheese, rice pilaf, applesauce, salad. Weight Gain: 5 lbs. Weight gain has been on the slow side, but baby is measuring on-track. My midwife says to expect a big jump in the next 4 weeks (an additional 6-8 lbs). Maternity Clothes: Living in the same few outfits, all of which are maternity. Tiho says I look fantastic because I'm wearing tight clothes to show off the belly. Ha! Physical Symptoms: Still experiencing random shooting tension up the back of my legs/hamstring: I call them "shooters." Had a few more lightheadedness/near-fainting episodes, including one during my ultrasound (I think caused by too much time on my back and subsequent pressure on the spine). If I lay on my side, breathe slowly, and sip water, I'm usually fine within 10 minutes, although that sweaty, fuzzy, panicky feeling is never fun. And oh boy, newest development this week: sensitive, puffy gums! I need to go in for a deep cleaning at the dentist, which I'm dreading. All in all, nothing too major, and typical for this stage of pregnancy. Day-to-day, I feel awesome. Sleep: Up at least twice a night to pee. Only sleeping on my sides, which has been difficult to get accustomed to. A pillow between my legs makes it more comfortable. Fears: Childbirth? I'm planning on going all-natural if possible, but can't let myself think too much about it or I get freaked out. We'll be taking a natural childbirth education class in September. Baby's Developmental Milestones: All the major parts are there! 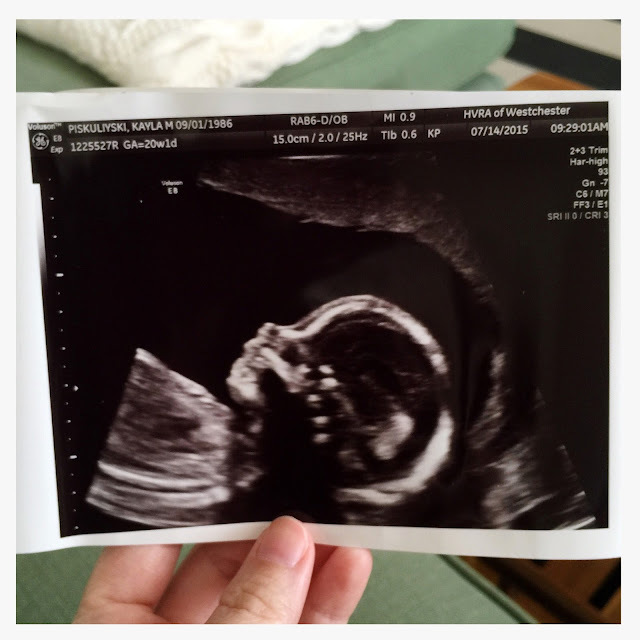 We think she has my nose based on the twenty-week ultrasound picture up there. I think she's adorable. Apparently, this is when babies begin developing specific tastes for certain foods based on what the mother ingests, so it's important I eat a well-rounded diet. She's probably going to love carbs and fruit. Tiho thinks I should eat lots of exotic things to optimize the chance of her developing an adventurous palate! General Mood & Emotions: So happy. Also, so in love with my husband. I got teary the other day thinking about how we only have a few months left together as "just us." I went up and hugged him and started crying over it. I'm SO excited to meet our little girl but also really trying to stay present and enjoy this season of life before it changes forever. Things I'm Looking Forward To: Savoring these slow summer days. Feeling her little kicks and movements! Nesting. We're going fairly minimal in terms of baby gear, but I can't wait to start planning her "corner." My in-laws generously gifted us our stroller when they were visiting from Europe last week. We'll probably keep it in the box for a while longer due to space constraints, but I loved the process of researching, test-driving and picking it out. Pretty kool article. Congrats on the baby! Comin from expierence the whole idea of pregnancy is or can be crazy to go through and somehow I did it twice(miscarried in between from an accident I had and didnt even know I was pregnant till I had gone to the ER that night). My first pregnancy just seemed to drag and drag so thats great that yours seems to be goin by sorta fast. I dont think I really had any cravings with my first and mainly with my second was apply slices and chocolate milkshakes from Stewarts. The only time I had any "morning sickness" was for some odd reason everytime I would(when I was living in NY) go up to this place called Deer Run(its a rv camp type of place) then I would randomly and for no reason get sick to my stomach. I dont wanna freak you out so dont really think about it but labor isnt fun to go through. Unless you can handle pain then it shouldnt really be a problem but if you cant like me and I dunno how I did it not once but twice BOTH natural besides some pain meds it wont be fun. I did it BOTH times WITHOUT the epidural, I wont get that done since I am petrified of needles I just had morphine and another drug that I cant remember the name of. The myth of "the first takes the longest" is deffinately true. My first took 9 1/2 hours of, to me, pure hell, I was induced for my first and my second did it on its own. I also had to have a major episiotomy for my first in order to get her out. My second only took 2 1/2 hours of labor and 7 mins to push out. Once its all over and you see and hear your baby cry for the first time its the best thing ever! It also seems like to me being induced takes forever for the process to actually start cause I was told to come into Albany Med the night before on Aug 8th of 2010, at 6pm and labor didnt end up actually starting till about 11am the NEXT morning on Aug 9th when I was pregnant with my first. I hope they got your due date right cause with mine I was actually given THREE due dates with my first and I think two with my second. Having kids is the best thing ever! Good luck with everything and I hope I was somewhat helpful with this comment.